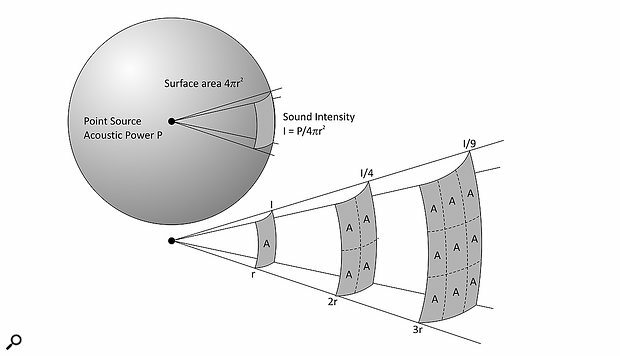 A spherical wave front: with every doubling of distance from the source of the sound, the sound intensity decreases by the inverse square of the radius of the sphere. If I sing at two inches from my hypercardioid or cardioid microphone I will hear more bass due to the proximity effect. If I sing at four inches instead (double the distance) the volume sensed by the microphone will drop by 6dB and I will have less proximity effect. If, instead of moving from two to four inches, I just drop the volume of my singing by 6dB, will I get the same result as if I were singing from four inches instead of two? I tried to sing at various volumes but my trials were not very conclusive... Perhaps I do not understand the proximity effect very well! But my question is this: can you decrease the proximity effect solely by lowering the volume? Thank you! SOS Technical Editor Hugh Robjohns replies: The change in sound level and the amount of bass boost due to proximity effect are related to the distance of the source from the mic. However, the causes are due to different aspects of the physics of sound waves — I’m afraid the proximity effect cannot be controlled simply by changing the volume of the source. Let’s consider the relationship between sound level and distance first. 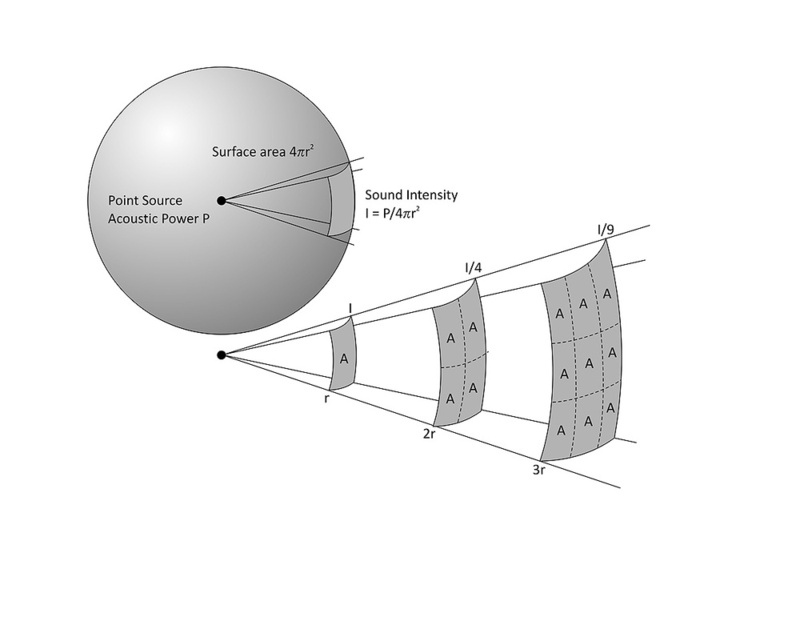 The reason the volume drops by (around) 6dB when the source distance is doubled comes from the ‘inverse square law’, associated with spherical wavefronts that are produced by point-sources of sound. Imagine a very tiny sound source, much smaller than the wavelength of any sound it creates. This will produce spherical sound waves that radiate equally in all directions. As the sound moves away from the source, the surface area of the sound wave grows exponentially, but as the amount of sound energy carried by that expanding spherical wave front is fixed, the sound intensity at any particular point on that surface reduces proportionally. To flirt briefly with some maths, the surface area of a sphere is calculated as 4πr2, and so for a given sound power (P) at the source, the sound intensity (I) at any given distance is I=P/4πr2. And this is where the ‘inverse square law’ comes from. If the distance is doubled, the sound intensity is reduced by 1/r2 — the inverse square — and if we translate that into the logarithmic decibel scale, it works out at a reduction in sound intensity of 6dB per doubling of distance. That’s all good theory, but the practice is slightly different, as the actual measured loss of level is rarely as much as 6dB per doubling of distance. This is partly because the source is generally not a true point-source, especially for high-frequency signals with wavelengths of a similar or smaller size than the source, which mean we’re not dealing with perfect spherical waves. At large distances from the source, the wave-front curvature effectively decreases, too, approaching something more like a planar wave, and in this condition, where successive wave fronts are virtually parallel, there’s much less energy dissipation over distance. Moving to the proximity effect, there are several ways of considering and explaining this phenomenon, but perhaps the easiest to grasp in this context also relates to the wave-front curvature — and specifically as it applies to low frequencies in (very) nearfield conditions. In deliberately simplistic terms, under nearfield conditions the high frequencies tend to arrive at the mic capsule as planar waves, so the pressure difference between the front and rear sound entry ports of a pressure-gradient capsule is relatively small. In other words, the pressure-gradient response to planar waves can be considered to be independent of frequency. That’s why there’s no proximity effect for distant sources where both high and low frequencies arrive as (something very close to) planar waves. In contrast, low frequencies in the very nearfield exhibit a high degree of wave-front curvature (the source closely resembles a point-source in comparison to the wavelength). Therefore the sound energy diminishes at a much greater rate with distance, and consequently the air pressure sensed at the front and rear ports of the microphone capsule are significantly different at low frequencies for very close sources. As it’s the difference in pressure that causes the diaphragm to move, the low-frequency sensitivity of the mic for very close sources is greatly exaggerated compared with that at high frequencies — we hear this as ‘bass tip-up’, or the proximity effect. Changing the amplitude or volume of a nearfield source doesn’t affect the wave-front curvature, so it doesn’t affect the amount of bass tip-up; only the source distance and frequency are relevant. However, something that will change the amount of proximity effect is the relative angle of the mic to the sound source. Rotating a directional mic (eg. a cardioid) so that it’s positioned at 90 degrees to the sound source means its front and rear sound-entry ports receive the same energy, regardless of signal frequency and wave-front curvature, so the proximity effect is eliminated. This can be useful, as it means that partially rotating a directional mic away from the source inherently reduces the proximity effect. Of course, moving the source off-axis to a directional mic also affects the sensitivity and tonal balance, but with a typical cardioid polar pattern this is usually relatively minor over a range of 45 degrees or so. I’ve taken advantage of this feature of directional mics often, for example when miking guitar cabs with ribbon mics, where the mic needs to be close to minimise spill but the bass tip-up is overwhelming — you just need to keep in mind where the polar pattern nulls and lobes are pointing as you alter the relative angle of the mic! So, to sum up, reducing the volume of your singing by 6dB won’t have any effect on the amount of proximity effect or bass tip-up, but moving your mouth to four inches away instead of two certainly will, as will moving off-axis around the side of the mic.